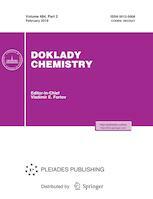 Doklady Chemistry is a journal consisting of English translations of articles published in Russian on chemistry and chemical engineering in the corresponding sections of Doklady Akademii Nauk. The journal's goal is to publish the most significant new research in chemistry and chemical engineering carried out in Russia today or in collaboration with Russian authors. The journal accepts only articles in the Russian language that are submitted or recommended by acting Russian or foreign members of the Russian Academy of Sciences. The journal does not accept direct submissions in English. Doklady Chemistry is a peer reviewed journal. We use open/single blind/double blind peer review formats. Our team of reviewers includes over 160 reviewers, both internal and external (70%). The average period from submission to first decision in 2017 was 3 days, and that from first decision to acceptance was 30 days. The rejection rate for submitted manuscripts in 2017 was 5%. The final decision on the acceptance of an article for publication is made by the Editorial Board.